Hazrath Khwaja Muinuddin Chishti Sanjari (God be pleased with him) was born in 536 A.H./1141 A.D. at a place called Sanjar, in Sijistan (Persia or present day Iran). He was in direct lineage of the Holy Prophet Muhammad (peace upon him and his family) being a paternally descended from the Holy Prophet’s grandson, Imam Hussain (Peace upon him) and maternally from the Holy Prophet’s grandson, Imam Hassan (Peace upon him) Thus he is a Hassani and a Hussaini Sayyid. The Chishtia Silsila is one of the most popular and influential Sufi orders in Islam. It derives its name from Chisht, a village near Herat, Afghanistan, where the founder of the Order, Khwaja Abu Ishaaq (God be pleased with him) of Syria, settled. 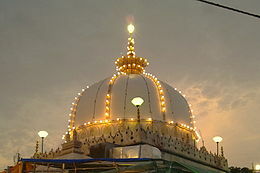 Hazrath Khwaja Muinuddin Chishti (God be pleased with him) brought the Silsila to India at the close of the 11th century A.D. and established its center in Ajmer, whence the order spread far and wide in India and became a force in the spiritual life of the Muslims.